Welcome to the skies of Air Warrior! Air Warrior is an online multiplayer flight simulator that was initially on the GEnie network in 1986 before being converted to run over the internet. The flight line comes with a stable of 17 WW II era fighters (P-51D Mustang, P-38J Lighting, F4U Corsair, Spitfire MK IX, BF-109F, FW-190, YAK-9D) and bombers (B-17G Flying Fortress, B-25J Mitchell, Junkers JU-88) from 5 nations for your aerial dogfights and bombing missions. Connect via the GEnie network or fly head-2-head against a friend at modem speeds as low as 1200 baud. If you played via GEnie network, the battles could contain up to 50 people from all over America at the same time. Each plane has unique features in regards to performance, maneuverability, and flight control characteristics. Using the keyboard control help-screen (brought up with the F10 key) during flight helps reduce the learning curve. Chat communication in real-time air battles is limited to keyboard text, which makes quick abbreviated responses a necessity. The game has SVGA graphics of 640x480 256 colors, which allows enhanced cockpit layouts, increased visibility, and realism during off-line training and online aerial warfare. 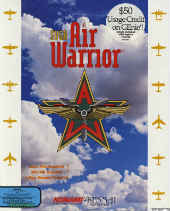 Air Warrior for Windows (AW4W) came out in 1996.